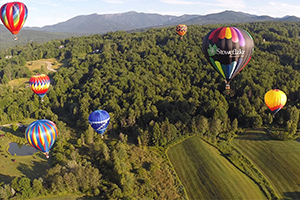 Now a four-season resort town, Stowe is a colorful fall getaway with idyllic mountain views and a bustling small town ambiance. It has a personality of its own. I stayed at the centrally located Stoweflake Mountain Resort & Spa (stoweflake.com) owned and run by the Baraw Family for half a century. 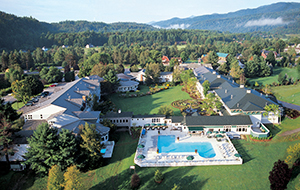 The 176-room resort is located at the bottom of Mt. Mansfield, Vermont’s highest peak. Here you will find something for everyone including great accommodations and the on-site Charlie B’s restaurant. The homemade kale hummus or spicy duck ninja roll are my recommendations for light lunch or a snack. Stoweflake affords guests everything from beautifully appointed rooms to luxurious suites with fireplaces, refrigerators, and whirlpool tubs. One-to-three bedroom townhouses sit on the resort’s perimeter, as does the 9-hole golf course, where the resort hosts the annual Hot Air Balloon Festival. Of course, after a day of activities, there’s nothing like some soothing rest. 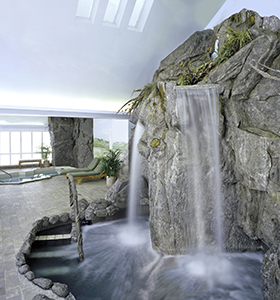 The Spa at Stoweflake is truly a state of the art sanctuary and features a fabulous Aqua Solarium. I felt like I just melted in a pool of warm naturally scented herbal oil as I relaxed during a special Abhyanga Ayurvedic massage, a continuous stream of warm lavender oil dripping on my forehead intended to re-balance my nervous system. 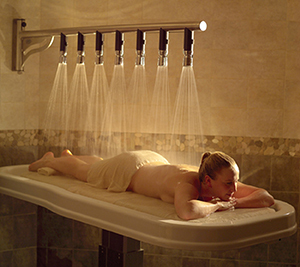 This was one of more than a hundred individualized spa treatments. Selecting the perfect treatment was a difficult choice—the enticing Vermont maple sugar body polish and the Green Mountain coffee body treatment were tempting. Afterward, take a stroll in the 10,000 square foot meditative spa garden. Inhale the scents of the fragrant herbs many of which are used in the spa treatments. The gentle Vinyasa yoga class was also superb with a knowledgeable instructor willing to work with participants at all levels of experience. Because fitness is paramount at Stoweflake, guests are encouraged to take advantage of the fully equipped Cybex fitness center, squash and racquetball courts. There are also indoor/outdoor pools, a golf course, and tennis courts. You never have to leave the property, but you’d miss the many other outdoor activities available. Be sure to explore the nearby Waterbury Reservoir—in the cleanest and most beautiful state parks I’ve seen in a long while—in a tandem kayak. A full-service outfitter offers rental equipment and guided foliage trips as well. 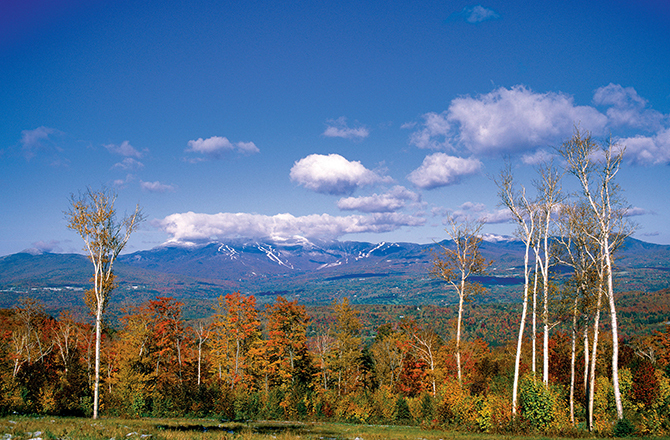 Stowe has many trails for hiking, mountain biking, and horseback riding. On the calendar this month, be sure not to miss the all-day annual Pumpkin Chuckin’ Festival family event on September 24th. You’ll witness medieval trebuchets—mobile cannon-like devices—that catapult pumpkins into the air as far as they can go. It’s quite a sight! For more exciting activities, be sure to see Susie, the knowledgeable resort concierge, who is always ready to plan your next activity whether athletic or cultural. The efficient concierge directed me to Stowe’s Historic Village about a mile and a half from the resort where the numerous specialty shops included handcrafted jewelry, art, and accessories. We saw everything from pottery, stained glass, and kaleidoscopes to comfy porch swings, perfect to relax for a short break. The Stowe Craft Gallery and Stowe Mercantile, an old fashioned country store with specialty foods and penny candy won’t disappoint. Artisan coffee, candy, and ice creameries abound and lure you in with the fresh aroma. Local breweries are plentiful in and around Stowe. In fact, Vermont’s craft beer industry has grown to more than 35 making it number one nationally for breweries and beer pubs per capita. The Alchemist, a family owned craft brewery and home of the famous, Heady Topper, has a welcoming tasting room as does Rock Art Brewery. The famous Von Trapp Brewing has a selection of authentic Austrian lagers with mountain top views in their new bier hall. Be sure to stop by the historic Trapp Family Lodge (trappfamily.com) for a drink and look out on the magnificent hills—sooner or later you’ll be humming The Sound of Music. Vermont is known for local products and the Stowe Farmer’s Market across from the hotel on Sunday won’t disappoint. Vendors, farmers and talented artisans are delighted to introduce their homemade products from syrups to cheeses to visitors. 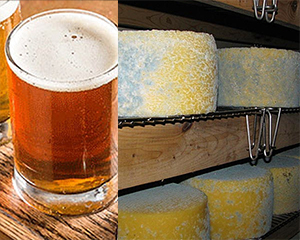 Handcrafted beers are also popular here and are marketed as craft mead. Try the local thirst-quencher Switchel which is made with vinegar and ginger water, sometimes cayenne and a shot of whiskey; it’s said to have health benefits. Down at the Sterling Brook Farm, owner Bambi Freeman has been raising sheep naturally in open paddocks since the early 70s. She is a regular at the farmers market selling meat, and hand-made woolen clothing and duvets. Each vendor has a story as well as products you’ll want to bring home. I am still delighting in the super light and delicate artisanal goat cheese covered with sea nettles. Stowe has lots to offer visitors of all ages which is just five-and-a-half hours away by car. If you prefer to fly the nearest airport in Burlington is just a short 40-minute drive to the resort. 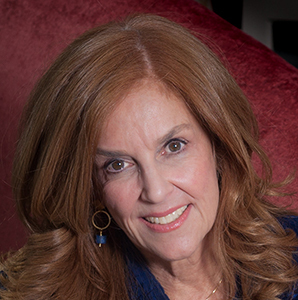 Karen Feld is an award-winning writer, speaker, and broadcaster.